Weedless spoons, unlike most other spoons that are considered as cold water lures, are ideal for catching bass in the grass in summer, or even remaining grass in fall. They excel in catching bass in shallow water grass, weeds, or other forms of shallow cover. They are designed with a curved convex bottom belly that allows them to slide over or move through thick cover where other lures dare not go. The weedless trait of these spoons make them a lure of choice for going after bass that are buried deep in thick weed beds, brush piles or any type of seemingly impenetrable vegetation. 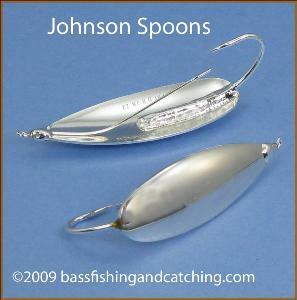 When these type spoons are retrieved over the top of cover bass below will often explode from hiding to attack what appears to be an easy meal. The wobble and flash of a weedless spoon has long been reputed as something that attracts "big bass" to leave the safety of the thick cover of grass to strike these lures. Weedless spoons have weed-guards made from thin wire, bristle or plastic. This "guard" will be attached to the spoon's inside belly, the concave side. Water temperature in excess of 70° is best for successful fishing of spoon lures that are weedless and it's almost never too hot for them. Why? Because the water under thick grass or lily pads is cooler than surrounding water and bass seek it out to escape the warmer water at the same depth in the rest of the lake. Weedless spoons are best fished early morning or late afternoon and cloudy days are better than bluebird days. Also, since these lures are "sight" lures they produce better in clear water than heavily stained or muddy water. There are two main techniques for fishing weedless spoons. One is "grazing the grass", or retrieving the spoon just over the top of surface grass or other surface leaves. The other is retrieving them just under the water's surface but just above the tops of "submerged" vegetation. Bass tend to hang close to the edges of large expanses of vegetation waiting in ambush for baitfish to wander by, especially if there is wind blowing into the grass. They'll not usually be found way in the middle of a field of vegetation, though clear bluebird skies will push them farther back from the edges. As you retrieve your spoon point your rod directly at the spoon, not off to your side. If the lure then catches on vegetation you're able to maneuver around grass, twigs etc maintaining a straight line through the grass. Otherwise, if you're pulling it at an angle when it's held back by vegetation it will release with a jerk. This defeats the benefit, i.e. enabling a bass to zero in and attack your lure, of your straight, steady, slow movement of the lure across vegetation. Repeated casts to the same spot are also important. We already know that it is difficult for the bass to "see" the spoon as it moves over the grass, even though it may have been heard. So if it's not taken on the first cast repeat to the same spot. The second, third or fourth time the bass may have finally figured out where to be to blast it next time it comes by. Remember, spoons are "sight" lures. Old "bucketmouth" must see it, or at least see the shadow of the lure, to strike it. Hooking bass with spoons can be difficult for a couple of reasons. First, bass are bad about "short striking" spoons. Even repeated strikes sometimes fail to result in a hook up. What can be done about this? First, you might bend the spoon's single hook out slightly to increase the chance of a solid penetration. Take care not to open the hook bend up so much as to place the hook point beyond the protection of the guard. to do so renders the weedless feature useless. Secondly, place a trailer on the single hook. This gives the lure more buoyancy, allows for a slower retrieve and a bigger profile for bass to target. Lastly, as stated earlier, make repeated casts to the place where a bass blew up on your lure but failed to hook up. Give it a few more chances to succeed. Once a strike occurs, drop your rod tip, hesitate a one, two count, then quickly snap it upward. If you merely pull the line tight to "feel" the bass you will most likely merely pull the lure away from it. Retrieve your spoon over thick grass with a slow and steady speed. This allows for bass to more easily track your lure. If fishing emergent weeds retrieve the same just below the surface. In both instances point your road at the lure as you retrieve holding it no more than 11:00 high for this will enable you to make a stronger hook-set than if the rod is to the side. If you're fishing a topwater spoon over floating-leaved weeds like lily pads retrieve to the edge of an opening in the pads then allow it to drop into the gap a few feet before resuming your retrieve. A strike often occurs on this drop.